Former Ocean County Superior Court Assignment Judge Vincent J. Grasso retired on July 1, 2015 just two weeks shy of 26 years of service to the New Jersey Judiciary. The former Assignment Judge attended Columbia University, graduating in 1972 with a B.A. in Economics, and Vermont Law School, receiving a J.D. in 1976. After 12 years of practice and five years of service as an Assistant Ocean County Prosecutor, Judge Grasso was appointed by Governor Thomas Kean to the Superior Court of New Jersey, Ocean County and was sworn in on July 14, 1989. Retired Judge Grasso currently is of counsel to the law firm of Carluccio, Leone, Dimon, Doyle & Sacks, L.L.C., 9 Robbins Street, Toms River, New Jersey, handling mediation and arbitration cases with their Alternate Dispute Resolution Department. He completed the forty-hour mediation workshop held by the “Program on Negotiation” at the Harvard Law School. 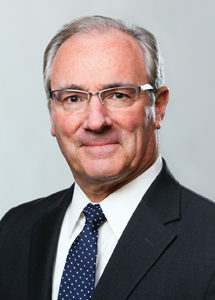 Judge Grasso served in all divisions of the Superior Court; first assigned to the Family Part from 1989 to 1994, and then the Criminal Part from 1994 to 1998. Judge Grasso served his second assignment in the Family Division as Presiding Judge for six years before returning to the Criminal Division in 2004. While serving as Presiding Judge of General Equity, he was named Assignment Judge of Ocean County by former Chief Justice James Zazzali on July 5, 2007 where he served until his retirement. During his service in the Judiciary, Judge Grasso chaired a statewide committee comprised of members of the judiciary throughout the State of New Jersey which revised the Domestic Violence Manual. He has served on various Supreme Court committees and has lectured at Judicial College. He served as Chair of the Supreme Court Advisory Committee on Extra-Judicial Activities as well as on the Judiciary Budget and Planning Committee. Judge Grasso chaired the Supreme Court ad hoc Committee on Judicial Disqualification. In 2014-2015, he chaired the New Jersey Judicial Council of Assignment Judges.